This chapter describes observed changes in sea level and wind waves in the Baltic Sea basin over the past 200 years and the main climate drivers of this change. The datasets available for studying these are described in detail. Recent climate change and land uplift are causing changes in sea level. Relative sea level is falling by 8.2 mm year−1 in the Gulf of Bothnia and slightly rising in parts of the southern Baltic Sea. Absolute sea level (ASL) is rising by 1.3–1.8 mm year−1, which is within the range of recent global estimates. The 30-year trends of Baltic Sea tide gauge records tend to increase, but similar or even slightly higher rates were observed around 1900 and 1950. Sea level in the Baltic Sea shows higher values during winter and lower values during spring and this seasonal amplitude increased between 1800 and 2000. The intensity of storm surges (extreme sea levels) may have increased in recent decades in some parts of the Baltic Sea. This may be linked to a long-term shift in storm tracks. Sea surface height (SSH) is an important indicator of variability and long-term change in climate. An understanding of the processes driving future trends in SSH on global to regional scales requires an understanding of the interannual to decadal (long-term) variability in the observational period. This requires an accurate assessment of past and recent change in global and regional SSH, including changes in mean sea level (MSL), extreme sea level (storm surges) and wind-generated waves. This chapter reviews what is known about change in SSH in the Baltic Sea region over the observational period (effectively the past 200 years) and the main drivers of this change. This includes a description of the datasets available for studying sea level and wind waves and a review of major findings for the Baltic Sea region. Change in the mean Baltic Sea sea level is the sum of global, regional and local effects. There are several definitions of the key terms necessary for understanding these effects in the literature. Thus, a clear definition of such terms is essential. Mean sea level (MSL) is defined as the average height of the sea surface at a specific location, neglecting short-term effects of tides and storm surges. Some studies, for instance Woodworth et al. (2011), consider annual means to define MSL, although other studies focus on monthly or seasonal means. The MSL can in turn be absolute or relative. Absolute sea level (ASL) is the height of the sea surface at a given location relative to a geocentric reference such as the reference ellipsoid and is measured by satellite altimetry . Relative sea level (RSL) is the height of the sea surface relative to the sea floor, and thus to land, at a given location, and is estimated using tide gauges or sea level reconstructions using information from the geological record. Relative sea level is more important than ASL for impact studies (see Chaps. 15– 22). The land surface may undergo vertical movements that may occur at millennial timescales (e.g. the glacial isostatic adjustment , GIA ) or at shorter timescales (e.g. due to water extraction or oil mining), or sudden changes (e.g. during earthquakes). In the Baltic Sea basin, GIA has a very important influence on RSL, stronger in the northern Baltic Sea and weaker in the southern Baltic Sea. The GIA is caused by the adjustment of the Earth’s crust and mantle to the disappearance of the ice sheets of the last glacial age. Thus, RSL trends may differ strongly from ASL trends in the Baltic Sea region. Global mean sea level (GMSL) is the average of sea level over the global ocean and over a period longer than the timescales for tides and surges. Local sea level (LSL) reflects changes owing to tides and surges down to timescales of a few minutes, including extreme sea level variations, at a specific locality. The most direct measurement of RSL is from tide gauges. Globally, the coverage of sea level data from tide gauges is limited in time and space. Most data are from the Northern Hemisphere and are for the latter half of the twentieth century. The Baltic Sea has one of the longest running and most densely spaced tide gauge networks in the world; many stations have been in continuous operation since the late nineteenth century. For example, the Stockholm time series is one of the oldest sea level records (Ekman 2003; see also Woodworth 1999 for comparison with other similar records). A remarkable number of long and high-quality sea level records are available for the Baltic Sea basin and, to date, more than 45 stations provide at least 60 years of data. Many of the sea level time series are freely available online through the Permanent Service for Mean Sea Level (PSMSL), which provides monthly and annual MSL measurements from around the world (Woodworth and Player 2003, www.psmsl.org), processed from high-frequency datasets. In these archives, stations with a full history of reference levels (benchmark datum history) have had their data adjusted to a fixed, revised local reference (RLR). Although the RLR time series are constructed to be continuous and relative to landmarks on the nearby land, corrections for the vertical movement of the reference (e.g. due to GIA) are not applied, because this requires a careful estimation of these movements usually involving a geodynamic model , which is not always available. Users of RLR data are aware of these limitations. The PSMSL RLR records are the most commonly used data bank for global and regional studies of historic sea level rise. However, as is the case for many other climate datasets (e.g. near-surface air temperature ) for some locations significant differences exist relative to other datasets. The differences may stem from the original data source or from different error correction methods (e.g. Dimke and Fröhle 2009). Historic sea level time series are available from several other sources, for example, for Stockholm (Sweden) (1774–2000; Ekman 2003), Kronstadt (Russia) (1816–1999; Bogdanov et al. 2000), Travemünde (Germany) (since 1826; Jensen and Töppe 1986) and various national institutions. To illustrate possible data limitations, Richter et al. (2007) analysed RSL data from archives of six different national state authorities for the German southern Baltic Sea coast. The records in these archives were often incomplete and lacked important additional information and a systematic cataloguing. To produce homogeneous datasets from such documents (written on paper) requires considerable effort. This is not only due to obvious sources of uncertainty, such as different measurement techniques and sampling frequencies (e.g. Richter et al. 2007; Ekman 2009), but also to change in the reference points. Such change could arise from the relocation of landmarks and to vertical landmark movements caused by geodynamic processes or to man-made modification of the tide gauge surroundings (e.g. coastal or port construction activities) (e.g. Bogdanov et al. 2000). Long Baltic Sea sea level records from different sources (not only PSMSL) have been used in a wide range of research papers for global sea level studies (e.g. Douglas 1992; Nakada and Inoue 2005; Jevrejeva et al. 2006, 2008; Merrifield et al. 2009; Woodworth et al. 2009; Church and White 2011; Houston and Dean 2011) and regional Baltic Sea studies (e.g. Andersson 2002; Omstedt et al. 2004; Chen and Omstedt 2005; Jevrejeva et al. 2006; Hünicke et al. 2008) (Table 9.1). Figure 9.1 shows sea level records for the Baltic Sea with at least 60 years of data through to recent times from the PSMSL together with other long Baltic Sea sea level datasets used in the published literature. Tide gauge operation, and the processing, distribution and archiving of the data are the responsibility of a single national agency per country, for instance the Swedish Meteorological and Hydrographical Institute (SMHI), the Danish Meteorological Institute (DMI), the Estonian Meteorological and Hydrographical Institute (EMHI), the Finnish Meteorological Institute (FMI) and the Wasser-und Schifffahrtsamt (WSA) in Germany. Because some agencies do not supply their data to the PSMSL database, there is no basinwide freely accessible network that combines all long sea level records from Baltic Sea tide gauges. For some applications, such as the study of extreme sea levels and storm surges, higher frequency data (more frequent than monthly average data) are needed. Some high-frequency data are available from the PSMSL/British Oceanographic Data Centre (BODC) and the University of Hawaii Sea Level Center (UHSLC, http://uhslc.soest.hawaii.edu/). However, most of the historic data are generally only available through the national agencies responsible for their collection. Real-time observations are available through the Baltic Operational Oceanographic System (BOOS, www.boos.org). Tide gauge-derived sea level records are based on local observations of RSL presenting the position of sea level with respect to land. Thus, these data include changes in ASL as well as vertical crustal movements, which can be of different origin and take various forms. In the Baltic Sea region, the most obvious phenomenon is the long-term and more or less constant change in the Earth’s crust caused by the GIA (e.g. Milne et al. 2001). The GIA evolves on millennial timescales and so can be assumed to be approximately linear on timescales of a few centuries. However, other short-term geodynamic phenomena can lead to a contamination of tide gauge-derived sea level records. For example, sinking of piers due to unstable foundations or land sinking due to groundwater extraction, etc., which occur on timescales of years and decades, must be taken into account in the analysis of tide gauge data. Owing to uncertainty in estimating the strong GIA signal in tide gauge records (measured relative to land), the dense network of Baltic Sea sea level observations is not generally used in the estimation of linear trends in global average sea level. For example, Baltic Sea tide gauge data are excluded from some well-known reconstructions of GMSL (e.g. Jevrejeva et al. 2006). The authors justified this exclusion by arguing that the trend in Baltic Sea sea level is strongly influenced by limited water exchange with the North Sea which leads to sea level rate curves being dissimilar from those for other regions. The strong GIA signal in the Baltic Sea region means that the RLR records must be carefully corrected before they can be used to estimate climate-driven trends in sea level. Satellite altimetry enables continuous and spatially resolved measurements over the global ocean of SSH relative to a reference geopotential ellipsoid. The use of satellite radar altimeters to measure global SSH began in 1978 with a measurement accuracy of tens of metres. More recent high-quality satellite altimeter missions started with TOPEX/Poseidon, launched in 1992, and were continued with Jason-1 and Jason-2. These satellites were specifically designed to measure SSH with a space-time point accuracy of a few centimetres. Since then, satellite altimetry has been an independent source of SSH measurements of the open ocean, allowing for more accurate estimates of globally averaged and large-scale sea level change (Cazenave et al. 2008) than point tide gauge data. The development of satellite radar altimetry techniques, complemented in 2002 by satellite measurements of the temporal development of the gravity field, made precise quasi-global and near-continuous measurements of SSH available for the study of sea level variability and change (Woodworth et al. 2011). These data have been used extensively to map global sea level change in recent years, verifying the suggestion (based on tide gauge records) that sea level change is not spatially uniform (e.g. Cazenave and Lovell 2010, see also Fig. 9.2). Satellite altimeter holdings are usually available as ‘along track’ datasets (with a time series of heights at a number of latitude grid points for each satellite pass) or as ‘gridded’ datasets (mapped and gridded, for example on a 1 × 1° resolution ). The spatial coverage of these monthly datasets is limited to the latitude band between 65°S and 65°N due to satellite orbit constraints. Several satellite datasets combining subsequent satellite missions, thus providing time-continuous records, are freely available from different sources (e.g. www.aviso.oceanobs.com, http://sealevel.colerado.edu, www.cmar.csiro.au/sealevel). These datasets may include several corrections, such as the barometer correction (due to the air pressure at the sea surface), seasonal cycles (annual + semi-annual) or GIA correction (due to the effect of the crust and mantle adjustment on the geopotential ellipsoid). While interest in global sea level studies often concerns ASL variability, satellite data must be treated with great care for regional purposes. For instance, the comparison of tide gauge data with data derived from satellite altimetry in the Baltic Sea region requires several corrections, such as for the GIA-related strong vertical movement of land and for the GIA-related change in the geoid. Furthermore, atmospheric pressure also influences sea level. Whether or not this latter effect should be included in the corrections may for instance depend on whether the objective of study is to determine long-term trends due to increased ocean temperature (correction required), or comparison to tide gauge data (correction not required) (Barbosa 2011). For example, Fernandes et al. (2006) showed that a specific atmospheric correction applied to altimetry observations can significantly affect the resulting sea level information, as the atmospheric pressure varies geographically and covers a wide range of spatial and temporal scales. Thus, the application of these corrections strongly depends on the research question. In contrast to global studies, only a few studies for the Baltic Sea region have so far (to 2012) used satellite datasets together with tide gauge readings to address different research questions (e.g. Liebsch et al. 2002; Novotny et al. 2005, 2006; Madsen et al. 2007; Hünicke and Zorita 2011; Madsen 2011). There are two other factors to consider when using satellite altimetry products in the near-coastal zone, in general and specifically for comparison with tide gauge observations. First, some of the applied corrections to the raw satellite data are not valid in the near-coastal zone, typically 50 km from any coast or island (Madsen et al. 2007). The most important is the wet tropospheric correction (Obligis et al. 2011): the altimetry estimation from the satellite radar travel-time is routinely recalibrated for the effect of changing tropospheric humidity , which is simultaneously retrieved by an on-board microwave sensor. This retrieval is erroneous in coastal regions and must be corrected. Second, the gridded altimetry products are interpolated in space and time, and across missing data. Interpolation should be undertaken with great care in the coastal zone, where the variability in space and time is much greater than in the open ocean. Some products include many interpolated data, while others permanently mask out areas which may have periods with invalid measurements, for instance in the case of seasonal ice cover. Along-track data with customisable processing are available from the Radar Altimeter Database System (RADS) database (Naeije et al. 2008; http://rads.tudelft.nl/). Another important feature of the satellite era is the application of the Global Positioning System (GPS) to measure continuously the vertical land movements (stated hereafter also as station velocities). Before the satellite era, change in sea level could only be assessed relative to points on land. Permanent GPS observations since the 1990s have accumulated sufficiently long time series to allow determination of the isostatic uplift (that is, the GIA). Uncertainty in the determination of the station vertical velocity may be strongly dependent on the station and on the model assumed for the measurement noise . Vestøl (2006) indicated an accuracy of between ±0.4 mm year−1 and ±0.5 mm year−1 for Fennoscandia, Lidberg et al. (2007, 2010) between 0.05 and 1.96 mm year−1 for Fennoscandia, and Richter et al. (2011) between ±1.4 and ±2.2 mm year−1 for the southern Baltic Sea. In the latter study, it became evident that the determination of reliable station velocities in the southern Baltic Sea poses a challenge (as the uncertainties exceed the small rates of land movement themselves; see Sect. 9.3.1.2 for more information). GPS measurements of vertical velocities within the Baltic Sea area are collected through different networks and projects, such as the BIFROST (Baseline Inferences for Fennoscandian Rebound Observations, Sea level and Tectonics) and the European Terrestrial Reference System (EUREF) Permanent Network (EPN) (EUREF 2011) networks as well as by the Satellite Positioning Service of the German State Survey (SAPOS). Good coverage exists for Germany, Denmark, Sweden and Finland, while coverage in other countries around the Baltic Sea is more limited (Lidberg et al. 2007; Knudsen and Vognsen 2010; Richter et al. 2011). The BIFROST network started in 1993 and comprises the permanent GPS network SWEPOS (SWEPOSTM, SWEPOS 2011) in Sweden and FinnRef (FinnRef®, FGI 2011) in Finland. There is also a GPS station network in Norway (SATREF®, SATREF 2011). A combined study of GPS stations relevant for the GIA process in Fennoscandia was reported by Lidberg et al. (2010). The advantage of GPS measurements is that they measure rates of vertical land movement , whether or not they are due to GIA or to other geological processes. Their disadvantage lies in their relatively short time span (since the 1990s). The determination of vertical crustal deformation rates finds application for the calculation of trends in ASL (see Sect. 9.3.2.1). Analysis of the GPS data in the Baltic Sea area yields a spatial pattern that demonstrates that ongoing crustal deformation in Fennoscandia is dominated by GIA. The overall change in MSL at the Baltic Sea coast is the combined result of, on the one hand, factors acting at large spatial scales, such as the postglacial rebound and the change in global ocean mass, and on the other, the contribution of regional and local oceanographic and atmospheric factors. Sea level within the Baltic Sea can deviate markedly from that of the North Sea immediately outside the Danish Straits (Madsen 2011). Long-term trends in GMSL for the past century have been mainly determined by the thermosteric contribution, that is, the thermal expansion of the sea water with rising ocean temperatures. Although the global mean trend is positive, there is strong regional variability due to the large-scale ocean circulation that modulates heat uptake by the ocean. Another large-scale contribution to the rise in GMSL has been the melting of land ice (glaciers and the polar ice sheets), although there is considerable uncertainty about the net contribution from the Antarctic Ice Sheet over recent decades (Cazenave and Remy 2011). This uncertainty originates in determining the net mass balance between melting, calving and precipitation over the ice sheet. Climate model simulations indicate that rising temperatures may have caused an increase in precipitation over polar ice sheets. Observations, however, do not show a trend in precipitation, but in these areas, they are sparse and do not have good spatial coverage. A third large-scale contribution to the rise in GMSL is land water storage and the use of subsurface water. The former limits sea level rise because some of the water that would normally flow into the ocean remains stored on land; while the latter increases sea level because it mobilises water into the ocean that would otherwise remain on continental areas. Long tide gauge observations over the twentieth century indicate that GMSL has risen on average by 1.7 mm year−1 (Bindoff et al. 2007). Tide gauges are located at the coast and are not fully representative of the ocean regions. Satellite altimetry data for the global ocean within the latitude band between 65°N and 65°S (see Sect. 9.2.2) indicate an average sea level rise for 1993–2007 of 3.1 mm year−1 (±0.4 mm year−1) with smaller values since 2003 of 2.5 mm year−1 (Cazenave et al. 2009). For more detailed information about the global sea level budget, see Chap. 14. The Baltic Sea is a region strongly influenced by GIA, which results even today in a maximum uplift of the Earth’s crust in the Gulf of Bothnia of roughly 10 mm year−1 (resulting in a negative trend in RSL) (e.g. Hammarklint 2009) and subsidence in parts of the southern Baltic Sea coast of about 1 mm year−1 (e.g. Richter et al. 2011). The local pattern of land movement may be modified by local natural or man-made land uplift or subsidence (see Sect. 9.2). Nowadays, different methods exist to study land movement effects. Traditionally, land uplift rates in the Baltic Sea region have been determined from sea level measurements (e.g. Vermeer et al. 1988). They are based on local (e.g. tide gauge ) observations of long-term trends in RSL, present the position of sea level with respect to land and, therefore, include both the signal related to vertical crustal movements and to changes in ASL. The first consistent map of the postglacial uplift of Fennoscandia was constructed by Ekman (1996), mainly on the basis of RSL records reduced to the common 100-year period 1892–1991, but also taking into account lake-level records and repeated high precision levelling. Two years later, Ekman (1998) presented an updated map of absolute vertical velocities (based on the results of Ekman 1996) by applying a GMSL rise of 1.2 mm year−1, deriving the rise of the geoid (relative to the ellipsoid) from computations of Ekman and Mäkinen (1996). In 2007, Rosentau et al. (2007) augmented the map of Ekman (1996) with data from tide gauge measurements from the southern Baltic Sea (e.g. from Dietrich and Liebsch 2000), and Ågren and Svensson (2007) presented an apparent land uplift map based on a combination of sea level results, GPS results and repeated levelling. Hansen et al. (2011) obtained an alternative estimate of the land uplift in the south-western Baltic Sea region based on tide gauge data and their determination of an ASL curve at the island of Læsø in Kattegat. After grouping the tide gauge stations, this study indicates a jump in the land rise coefficients across southern Denmark (not seen in other studies including precise levelling campaigns). In Estonian studies, the applied land uplift rates are still based on a map compiled on the basis of national high precision levelling (1933–1943, 1956–1970, 1977–1985) by Vallner et al. (1988). Along the Estonian coast, uplift rates vary between 0.5 and 2.8 mm year−1. According to Suursaar et al. (2006a), the accuracy of these rates, compared to the map of Ekman (1996) of the postglacial uplift of Fennoscandia , lies in the range ±0.4 mm year−1. Lithuanian sea level studies do not consider any land movement effects in their analysis of sea level variability because ‘researchers recommend different estimates of land sinking in the Lithuanian Region’ (0–2 mm year−1) (Dailidienė et al. 2006). Land movement due to the GIA effect can be calculated with an ice load model (e.g. Peltier 1998). This estimation does not consider other land motions (e.g. sinking piers or short-term motion due to earthquakes). Milne et al. (2001) considered the GIA correction for the Baltic tide gauge records as critical because of the large GIA amplitude (~10 mm year−1) relative to the global trend (~1–3 mm year−1). However, recently, new geodetic techniques such as the application of GPS (see Sect. 9.2.2) allow for measurements of more precise absolute rates of vertical land movements and lead to considerable progress by comparison with those derived from tide gauges, ice load models or corrections from geological data. Vertical land movements (station velocities) based on observations at permanent GPS stations in Sweden and Finland (1993–2000) were presented by Johansson et al. (2002), Scherneck et al. (2002) and used by Milne et al. (2001, 2004), for example for the estimation of regional sea level rise, together with Fennoscandian tide gauge records. An update of station velocities was presented by Lidberg et al. (2007) for the period 1996 to mid-2004, including some additional sites in Norway, Denmark and northern Europe, and showing much smaller uncertainties in station velocity compared to Johansson et al. (2002). An overview of published station velocities was provided by Lidberg et al. (2010). Figure 9.3 shows the vertical velocity rates for Scandinavia from the analysis of a regional GPS network by Richter et al. (2011). The application of these rates to the presented map of RSL changes in Fig. 9.7 (left) can be used to estimate ASL changes in the Baltic Sea region. Hill et al. (2010) introduced a new technique to combine geodetic observations and models for GIA fields in Fennoscandia by assimilating GPS-derived and tide gauge data together with gravity rates from the Gravity Recovery and Climate Experiment (GRACE) into their model approach (see also Chap. 14). The updated model shows a spatial pattern and magnitude of peak uplift (9.5 ±0.4 mm year−1) that is relatively consistent with previous findings (e.g. Johansson et al. 2002; Milne et al. 2004), but with a different—more easterly—peak uplift location in the middle of the northern Gulf of Bothnia. Previous studies (e.g. Milne et al. 2001; Johansson et al. 2002) indicated the peak uplift slightly to the west of the northern Gulf of Bothnia. In addition to the long-term global sea level rise and land movements , sea level in the semi-enclosed Baltic Sea is modulated by meteorological factors, especially wind forcing. Winds play a key role, as persistent winds from the south-west or north-east transport water into or out of the Baltic Sea, respectively, thereby raising or lowering Baltic Sea sea level as a whole. According to Ekman (2007), temporary winds redistribute the water within the Baltic Sea, producing high or low sea levels at the ends of the basin depending on wind direction. Sea level variations in the Baltic Sea at interannual to decadal timescales are strongly influenced by the strength of westerly winds, closely related to the North Atlantic Oscillation (NAO). The NAO represents the large-scale circulation over the north-west Atlantic (see Chap. 4, Box 4.1 for detailed information). A positive NAO (strong Azores High and Icelandic Low) is associated with warm and humid winters and strong westerly winds in the Baltic Sea area, which causes sea level to rise; a negative NAO (weak Azores High and Icelandic Low) is associated with cold and dry winters which causes sea level to fall. The correlation between the NAO and Baltic Sea sea level is especially strong in winter (e.g. Andersson 2002; Dailidienė et al. 2006; Hünicke and Zorita 2006; Suursaar and Sooäär 2007), and in northern and eastern parts of the Baltic Sea (Johansson et al. 2004; Suursaar et al. 2006a) (see Fig. 9.4, right panel). However, in the southern Baltic Sea, the correlation between the winter NAO index and winter sea level is low (Hünicke and Zorita 2006; Jevrejeva et al. 2005). In addition, in the Baltic Sea basin as a whole, the strength of the correlation between the winter NAO index and winter MSL changes significantly over time (Fig. 9.4, left panel; also shown by Jevrejeva et al. 2005). Although the NAO is the dominant sea level pressure (SLP) large-scale pattern of the North Atlantic in wintertime, it explains (on average) only 32 % of the total variability of sea level at interannual timescales (e.g. Kauker and Meier 2003; Jevrejeva et al. 2006). Thus, estimation of the full amount of variability that can be explained by the atmospheric circulation (and not only by the NAO) must consider the whole SLP field of the North Atlantic–West European region. Such an analysis was presented for the first time for the Baltic Sea by Heyen et al. (1996). In a more recent study, Hünicke et al. (2008) statistically analysed the influence of different atmospheric forcing factors (temperature, SLP and precipitation) and found that decadal sea level change in the Baltic Sea basin varies geographically. In the central and eastern parts of the Baltic Sea, winter sea level variations at decadal timescales are explained well by SLP variations (and not only the NAO). For the southern part, area-averaged precipitation seems to better explain statistically the decadal variations. Thus, depending on future climate trends (see Chaps. 11– 14), a different behaviour of future sea level trends in southern and eastern and northern parts of the Baltic Sea might be possible. On the other hand, Ekman (2009) offered a different, purely dynamic, explanation for the observed correlation between SLP and the southern Baltic (low correlation) and northern Baltic (high correlation). This explanation involves the basinwide response of SSH to sustained westerly winds (long-term response). The variations should be greater away from the connection to the North Sea and smaller closer to it. However, questions remain, such as the instability of the correlation with the NAO over time and the long-term correlation between southern Baltic Sea sea level and precipitation, which is evident in low-pass filtered decadal time series. Omstedt et al. (2004) investigated variability and trends in observed time series for the Baltic Sea region from the past two centuries and found pronounced positive trends in Stockholm sea level variations and anti-cyclonic circulations. For the period 1985–2000, trends in air temperature and sea level anomalies were found to be positive, lying outside the range of normal variation for the past 200 years (see also Sect. 9.3.2.1). Getzlaff et al. (2011) observed an offset in detrended monthly MSL anomalies (taken from PSMSL) for the periods 1970–1988 and 1989–2008 and associated it with a shift in strong wind events and with the change in prevailing wind directions (as a result of an increased positive NAO) (Lehmann et al. 2011). The shift was found to occur uni-directionally over the whole Baltic Sea area, which suggests a change in the prevailing westerly wind situation controlling MSL variations. The results agree with findings of a numerical model simulation and confirm findings of recent studies of historic sea level time series (e.g. Johansson et al. 2004). Dailidienė et al. (2011) studied water level and surface temperatures of coastal lagoons along the southern and south-eastern shores of the Baltic Sea (Curonian and Vistula Lagoons and Darß-Zingst Bodden chain), relating the observed increase in water level (greatest in the east) and water temperature since the 1980s to changes in the NAO. Within the Baltic Sea, the trends in coastal sea level display a strong influence of the isostatic dynamics following the last deglaciation. Thus, RSL is falling in the northern Baltic Sea and rising in the southern Baltic Sea, due to the combined effect of crustal deformation and volumetric sea level changes. Superimposed on the long-term trends that affect RSL, many climate factors, such as changes in water density, changes in the total volume of the Baltic Sea and currents, can modulate ASL within the whole or parts of the Baltic Sea basin. Sea level may thus display considerable variability on timescales ranging from minutes through the annual cycle, to decades. Some studies have analysed observations from permanent GPS stations to determine crustal deformation rates and used these and repeated levelling data to derive ASL changes from tide gauges . For instance, Milne et al. (2001) estimated a regional ASL rise of 2.1 ± 0.3 mm year−1 using annual tide gauge means from records (provided by PSMSL) at 20 sites in Fennoscandia spanning 35 years or more, and using only data acquired during or after 1930. Hill et al. (2010) combined geodetic observations and models and estimated a spatially averaged rate of ASL change of around 1.5 mm year−1, based on monthly RLR tide gauge means (from PSMSL) from records at 40 sites in Fennoscandia that provide more than 40 years of data. Richter et al. (2011) derived a mean ASL value of around 1.3 mm year−1 for 13 tide gauges for which a GPS station is located nearby. Nine of these gauges were sites on the southern Baltic Sea coast, spanning almost 200 years, and complemented by monthly tide gauge means from 51 (basinwide) PSMSL sites that report more than 60 years of data in the period 1908–2007. Additionally, regional focused studies that combined geodetic and tide gauge data information found ASL values of around 1.3 mm year−1 for the Scandinavian coast (1891–1990, Vestøl 2006), 1.8 mm year−1 for Danish sea level stations (1900–2000, Knudsen and Vognsen 2010) and 1.5 mm year−1 for Swedish tide gauge stations (1886–2009, Hammarklint 2009, see Fig. 9.5). Ekman (2009) indicated a rate of climate-driven sea level rise in Stockholm of about 1 mm year−1. For more detailed information, see the original references. When the reported uncertainty is considered, the results of all the previously cited studies lie within the error bars of the rate of GMSL rise of 1.7 ± 0.5 mm year−1 reported in the Fourth Assessment of the Intergovernmental Panel on Climate Change (Bindoff et al. 2007). However, it should be remembered that regional long-term trends in sea level can deviate substantially from the global mean. This was also demonstrated by Madsen (2011), who estimated linear sea level trends from a gridded satellite altimetry dataset (1992–2008, multi-satellite open ocean product with 1-degree, 10-day resolution). This resulted in a best estimate mean trend of 5.8 mm year−1 for the Baltic Sea area, but with a high uncertainty in the trends of a few millimetres per year (Fig. 9.6). For comparison, the global mean value (3.23 ± 0.04 mm year−1) and the Atlantic mean (3.3 ± 0.1 mm year−1) were also calculated for the same dataset and time period. Madsen (2011) concluded that the uncertainty in the estimation of regional trends is much greater, both because of the smaller number of samples and, especially for the Baltic Sea, because of the large natural variability . This also means that the trends are sensitive to the choice of time period. With these reservations, it can be seen that the North Sea trend is likely to be lower than the global mean and that the Baltic Sea trend is very likely to be higher than the global mean and perhaps just as interesting for the Danish area, higher than the North Sea trend. In recent years, changes in Baltic Sea RSL, as the most important factor in impact studies, have been the subject of a wider range of publications, mainly on the regional (e.g. national) to local (e.g. only one tide gauge) level. However, a comparison of the different results is hampered by different observation periods (and the treatment of data gaps therein) and analysis techniques. Thus, the cited RSL trend values that follow must be treated with great care. Navrotskaya and Chubarenko (2012) studied annual (and extreme) sea levels in the Russian sector of the Vistula Lagoon situated in the south-eastern part of the Baltic Sea. They found annual mean linear RSL trends in the range 1.7–1.9 mm year−1 (Baltiisk, 1860–2006; Kaliningrad, 1901–2006) to 3.6–3.7 mm year−1 (Kaliningrad, Baltiisk, Krasnoflotskoe, 1959–2006). On the sea coast (Pionerskii, 1959–2006), the trend in the latter half of the twentieth century amounted to 2.6 mm year−1 only. To the authors’ knowledge, no published sea level studies are available for the Latvian coasts, but linear trend estimations at two sites (Liepaja 1865–1936 and Daugavgriva 1872–1938) are available through PSMSL. For the Estonian coastline, Suursaar and Kullas (2009b) estimated linear RSL trends of 1.5 mm year−1 (Pärnu 1924–2008), 1.8 mm year−1 (Tallinn, 1899–2005) and 0.5 mm year−1 (Narva-J. 1899–2008). Dailidienė et al. (2006, 2012) estimated linear annual mean RSL long-term trends for Lithuanian tide gauges, ranging from 1.3 mm year−1 for the centennial trend (Klaipeda Strait 1998–2002; situated on the open Baltic Sea coast) to 2.4–2.9 mm year−1 for sea level stations reporting between 1961 and 2002 (Juodkranté, Vida, Venté; situated in the Curonian Lagoon). Figure 9.7 displays maps of the secular (100 years) RSL changes compiled by Richter et al. (2011) based on long tide gauge measurements of the Baltic Sea region based on data from PSMSL (including Polish, German, Danish, Swedish and Finnish tide gauges) and data compiled on the basis of historic documents (at German and Polish sites). The pattern in RSL trends (Fig. 9.7, left panel) shows a clear north–south gradient within the Baltic Sea region, reflecting the crustal deformation due to the GIA effect. In the northern part, stations indicate large negative RSL trends. A maximum rate of 8.2 mm year−1 is found in the Gulf of Bothnia, in the area of predicted maximum GIA-induced crustal uplift (e.g. Peltier 2004). Tide gauge measurements along the southern Baltic Sea coast yield positive rates of around 1 mm year−1, which implies a rising sea level relative to the Earth’s crust. However, the pattern of trends over the southern region is not uniform and displays a clear gradient in the north-easterly direction (Fig. 9.7, lower right panel). The spatial pattern in long-term trends in sea level should, in general, also reflect the spatially varying fingerprints of sea level change due to recent mass changes in the polar ice sheets and, accordingly, the change in the gravity field of the Earth’s surface (Tamisiea et al. 2003; Milne et al. 2009). As demonstrated by Mitrovica et al. (2001), the pattern caused by the melting of the Greenland Ice Sheet is negligible for the Baltic Sea region, as its zero-line intersects this region, and the remaining variations are below the accuracy of the derived RSL rates, ranging between 0.1 and 0.3 mm year−1. On the other hand, the pattern caused by the melting of the Antarctic Ice Sheet does affect the Baltic Sea region, but can be expected to be nearly constant over the entire region (see also Chap. 14). There exists, however, considerable uncertainty about the sign of the mass balance of the Antarctic Ice Sheet in the twentieth century, due to the competing effects of melting, calving and precipitation. Richter et al. (2011) also analysed the variation in the annual mean RSL at long tide gauge records, such as the Polish tide gauges Swinoujscie and Kolobrzeg (Fig. 9.7, upper right panel). Both time series show consistent behaviour with a slight negative trend throughout the first decades of the time series up until 1860, followed by an increasing trend of around 1 mm year−1. The authors suggested, as a possible explanation for this trend, climatic effects related to the Little Ice Age . This is consistent with Ekman (2009 and references therein) for the GIA-corrected ASL trend of 1.01 mm year−1 for the Stockholm time series. (Figure 9.7 includes, for illustration, the RSL Stockholm series that displays a strong negative trend due to the GIA). However, it should be remembered that due to decadal variations in the RSL trend, a comparable determination of secular RSL changes at different stations requires the application of identical observation periods (Richter et al. 2011) and analyses techniques. The long-term trends of Baltic Sea RSL in the period with direct observations have been analysed by Barbosa (2008) and Donner et al. (2012). As well as estimating trends in the median sea level , they also estimated trends in the quantile of the probability distributions of monthly MSL at different gauges along the Baltic Sea coast (Fig. 9.8). The trends clearly exhibit the effect of the GIA. Interestingly, the trends in the median sea level do not always coincide with the trends in the extreme high and low quantiles. Whereas the low quantiles of the distributions show basically the same trend as the median, the upper quantiles tend to display a more positive trend. Therefore, the higher values of RSL are increasing more rapidly, or decreasing more slowly in the regions with isostatic uplift. This happens more markedly in the northern Baltic Sea and has also been confirmed by more locally focused studies on Estonian sea level (Suursaar and Kullas 2006). The reasons for this different behaviour are not clear, and many factors such as the atmospheric circulation could contribute. In the Estonian case, due to the form of the coastlines, the fingerprint of forcing by the atmospheric circulation at interannual timescales is clearly detectable. Therefore, a reasonable conjecture is that the atmospheric circulation, in particular the NAO, may also be involved in the long-term trends of the upper sea level quantiles in wintertime. However, the NAO exhibits a positive trend only in the last decades of the instrumental record, and not over the whole twentieth century. Also, the NAO trend in the very last two decades has been negative (Pinto and Raible 2012). Other atmospheric circulation patterns different from the NAO may also play a role (see Sect. 9.3.1.2 Meteorological influence). For example, Omstedt et al. (2004) found that the frequency of anti-cyclonic situations over the Baltic Sea increased in the late twentieth century imprinting its influence on several climate variables, also on the Stockholm sea level data. The causes of linear trends in sea level, therefore, may depend on the timescale over which these trends are calculated. At decadal and multi-decadal timescales, the internal variations of the atmospheric circulation may exert a strong influence. The NAO, as previously indicated, undergoes multi-decadal phases of increase and decrease. Over longer timescales, such as the centennial scale, the influence of the atmospheric circulation is strongly averaged out and is likely to become weaker relative to other external forcing. In this respect, Ekman (2009) found that the probability distribution of monthly sea level in Stockholm has also undergone large changes over time, with a much narrower spread prior to 1950 than in later decades. Baltic Sea sea level has undergone decadal variations around the quasi-linear long-term trend dominated by the GIA. These decadal variations were found to depend on the season. For example, Chen and Omstedt (2005) found for the Stockholm sea level record that all months except June and August display positive sea level trends. The authors connected the negative trends in June and August to a negative long-term trend in Baltic Sea precipitation during these months. However, they stated that these findings have still to be justified by a detailed analysis of the hydrological budget. An illustration of decadal long-term wintertime variations in sea level for the past 200 years was presented by Hünicke et al. (2008) for four different sites (Fig. 9.9). Ignoring the GIA-related trend, winter Baltic Sea sea level generally displays higher values around 1820, 1910 and in the most recent decade, and lower values around 1875, 1940 and 1970. However, the homogeneity of the data may be compromised at the beginning of the record. Since the decadal variations are not totally coherent through time, the precise mechanisms responsible for them have not been ascertained. The decadal variations may have been caused mainly by atmospheric circulation, but also by precipitation and variations in ocean currents. Scotto et al. (2009) analysed the spatial coherence of long (>30 years) monthly records of RSL from 14 tide gauges in the Baltic Sea by applying cluster analysis. The coherent regions were defined in terms of the statistical properties regarding their serial auto-correlation. At timescales of up to three months, the usual Baltic Sea sub-basins emerged as individual clusters. For longer timescales, up to six months, all regions with the exception of the areas close to the North Sea displayed high coherency. The long-term changes in Baltic Sea sea level have been also found to depend on the season. Sea level displays an annual cycle and is generally higher during winter months and lower during spring (as demonstrated by Hünicke and Zorita 2008, see Fig. 9.10). Changes in the annual sea level cycle were studied by Ekman and Stigebrandt (1990), Ekman (1999) for the Stockholm sea level record (covering the ninetieth and twentieth centuries). The authors associated the increase in the amplitude of the dominant annual component to changes in winter wind condition. Hünicke and Zorita (2008) statistically analysed 30 sea level records from PSMSL (covering the twentieth century) and four long historic sea level records (covering the ninetieth and twentieth centuries, including Stockholm), together with climatic datasets, to investigate centennial trends in the amplitude of the annual cycle. They detected a statistically significant increase in amplitude (winter-spring sea level) in the annual cycle in almost all sea level records investigated, but of a weaker sign than the decadal variations in the annual cycle. As the magnitude of the trends appeared almost uniform, with the exception of the Skagerrak area, they concluded that the driving mechanism for the trends in the annual cycle is very likely to be of non-regional origin. Testing several hypothesised factors to explain these centennial trends (wind through the SLP field, the barometric effect, temperature and precipitation), only precipitation remained a plausible candidate in their analysis. The physical mechanisms responsible for the long-term trend due to changes in precipitation could be related to salinity changes and their effect on changes on water density. This remains to be resolved. Plag and Tsimplis (1999) investigated the spatial and temporal variability in the seasonal cycle of sea level for PSMSL tide gauge records in the North Sea and Baltic Sea. They related the variability detected to changes in the position and extent of the separation zone between maritime and continental climate regions. However, the decadal variations in the amplitude of the annual sea level cycle can be due to slow variation in the wind forcing, especially at regional scales and at locations where the geometry of the coastline is favourable for wind-driven change to become evident. For instance, in the Gulf of Riga and Väinameri area, results from a two-dimensional hydrodynamic model indicate that a relatively modest increase in wind speed (2 m s−1) could be responsible for a mean increase in sea level of up to 5 cm, in addition to an analogous change in the Baltic Sea MSL (Suursaar and Kullas 2006). Consequently, a total wind-induced average sea level rise of 7–10 cm could occur at locations like Pärnu and Matsalu, Estonia. In these areas, changes of a similar magnitude probably occurred between 1950 and 1990 (Suursaar and Kullas 2006). 9.3.2.3 Is Sea Level Rise Within the Baltic Sea Accelerating? A relevant question in the context of climate change is, whether the rise in global sea level is accelerating? Projections of the future magnitude of global sea level rise are still very uncertain, mainly due to the difficulty in estimating the effects of warming on the dynamics of the polar ice sheets. Also, there is a wide spread in the projections of the future thermosteric effect simulated by the suite of climate models for 2100, between about 10 and 40 cm in the global mean (see also Chap. 14). Global sea level is currently rising at about 3.2 mm year−1 (Church and White 2011). If this trend continues through the twenty-first century, sea level rise by 2100 would be about 30 cm. The projections from global climate models , augmented by the more uncertain estimates of the dynamics of ice sheets and coastal glaciers, imply therefore an acceleration from the present rate of global sea level rise (see also Chap. 14). This is not necessarily the case for regional sea level rise, however, especially for the Baltic Sea with its complex coastline and the many different processes modulating its response to global warming . Nevertheless, the question as to whether the rate of sea level rise in the Baltic Sea is accelerating is relevant for adaptation to climate change and other planning purposes over the coming decades. A preliminary indication of acceleration may be conveyed by a change in the long-term linear trends in two different periods of the recent past. Ekman (2009) suggested that the rise identified in the Stockholm sea level record is accelerating because the trends before and after 1950 look different (Fig. 9.7, upper right panel). However, this simplistic view should be complemented, if possible, by studies that analyse jointly the observed evolution of sea level and the theoretical evolution that sea level should display as a response to anthropogenic climate change. A change in the rate of sea level rise may not necessarily be projected by numerical climate models. Most studies implicitly define the concept of ‘acceleration’ of sea level rise, possibly influenced by anthropogenic climate change, in one of two ways. The first approach is to look for a long-term increase in the rate of sea level rise, while the other compares the recent rate of sea level rise against rates observed in the past. The difference between both approaches can be illustrated by the following example. Given a sea level record, the linear trend of sea level change in sliding windows of fixed length (such as 30 or 50 years) can be calculated (Richter et al. 2011). If the linear rate in the most recent window is the highest, it could be claimed, following the second approach, that the present rate of increase is unprecedented, and thus possibly related to anthropogenic climate forcing. However, due to decadal variability in the rate of change, the linear rate in the most recent window may not be the highest over the whole record length. However, if the linear trends over the sliding windows itself display a linear trend, it could be claimed, following the first approach, that sea level rise is accelerating in that particular record. In a variant of the first approach, the long-term trends in sea level rise is determined by fitting a second-order polynomial in time to a sea level record (Church and White 2006; Woodworth et al. 2009). If the quadratic coefficient is found to be significantly different from zero, acceleration could claim to have been identified. More loosely, if abrupt changes are identified in the linear trends—denoted inflexion points—these may be attributed to acceleration or deceleration. Sea level acceleration has been looked for using both approaches in global studies. For the Baltic Sea, these approaches have yielded contradictory results. Woodworth et al. (2009) found a positive quadratic term for the rate of rise in mean Baltic Sea sea level of the order of 0.005 mm year−2, derived from the global sea level reconstructions of Church and White (2006) and consistent with values found specifically for the Stockholm sea level record (Woodworth et al. 2011). However, the Baltic Sea series provided by Jevrejeva et al. (2008) displayed a deceleration inflexion point around 1920. The different perspectives on acceleration may be illustrated by the results of Richter et al. (2011) (Fig. 9.11) for the Warnemünde sea level record, a station in the southern Baltic Sea. The 30-year trends indicate that the present rate of rise is not unprecedented in the record. Although the recent linear trends are high, similar or even slightly higher rates were observed around 1900 and 1950. These findings generally agree with the (non-peer-reviewed) results of Zorita and Hünicke (2010), who presented sliding linear trends of long sea level records, estimated by linear fit in moving 31-year windows for Stockholm (Sweden), Kronstadt (Russia), Kolobrzeg and Swinoujscie (Poland). The time series of sliding 30-year trends (Fig. 9.11) illustrates the very high variability in sea level rise in the southern Baltic Sea over relatively short periods. Although the 30-year trend time series displays a slight positive upward trend, its statistical significance is low due to the large decadal variability . For trends over wider sliding windows (such as 60 or 80 years—see Fig. 9.11), the variability is reduced and a long-term increase in the linear rates of rise is easier to see. However, wider windows reduce the number of independent degrees of freedom which also compromises any estimate of statistical significance. It is clear therefore that, depending on which approach is used, the same long-term sea level record may appear to exhibit both the presence and absence of a significant acceleration in sea level rise. In cases where acceleration in sea level rise has been identified, this should ideally be accompanied by an estimate of its level of statistical significance. As in any statistical test, a general algorithm to attach a certain level of statistical significance of an estimated value cannot exist, since the significance level depends on the formulation of the null-hypothesis, against which the statistical test is conducted. This formulation is subjective, and different authors may consider different null-hypotheses to describe the statistical properties of the natural fluctuations in the rate of sea level change. Donner et al. (2012) reported different levels of statistical significance for the estimated acceleration depending on whether the data were assumed to be serially correlated or serially independent. The authors also attempted to estimate the acceleration in the rates of change of the quantiles of the distribution of monthly sea level for a set of Baltic Sea coastal stations. The record length across the dataset is not uniform and so the spatial patterns of the acceleration estimate and its level of statistical significance may be strongly influenced by data availability. When the analysis is applied to the period covered by all sea level records (1951–2000), none of the quantiles of the probability distribution display statistically significant accelerations if the de-seasonalised monthly sea level data are assumed to be serially correlated. However, they do underline that statistical detection of acceleration in only 50 years of data may not be possible due to the short record length. Extremes in coastal sea level oscillations pose a serious threat to coastal populations as their impacts can be catastrophic. At many coasts around the world, extreme sea levels are essentially determined by tides; however, this effect is negligible in the Baltic Sea due to the semi-enclosed nature of the basin. Lowe et al. (2010) reviewed change in extreme sea levels in recent decades and concluded that—globally—there is little evidence of change in extreme sea levels over an extended period, a behaviour which differs significantly from the change in GMSL. In their quasi-global investigation, Menendez and Woodworth (2010) showed that recent change in extreme sea levels is mostly due to the change in MSL (by a shift in the frequency distribution), while meteorological contributions vary on timescales of years and decades but mostly show no clear long-term trend. Thus, the question arises as to whether the amplitude and frequency of extreme sea level events in the Baltic Sea is changing and if so, how they compare to changes in Baltic Sea MSL. Because of its elongated shape, semi-enclosed configuration and presence of shallow bays exposed to the direction of strong winds, storm surges occur frequently on exposed coasts of the Baltic Sea. In contrast to tide-dominated basins, extreme sea levels in the Baltic Sea are mainly due to wind (wind set-up). Other contributors include the inverse barometer effect, standing waves (seiches) and the propagation or amplification of remotely generated long waves. Winds affect sea level in two main ways (e.g. Samuelsson and Stigebrandt 1996; Ekman 2007). First, wind may build up a sea level slope within the Baltic Sea, resulting in the strongest deviations at the ‘ends’ of the Baltic Sea (in the Belt Sea and the gulfs of Finland, Bothnia and Riga). Second, when a strong persistent wind from the south-west or north-east is blowing over the Baltic Sea and its entrance, water is transported into or out of the Baltic Sea, thereby raising or lowering sea level in the basin as a whole. Although the amplitude of such events is normally less than 50 cm, they can provide preconditions for much larger local-scale storm surges when combined with short-term storm winds during cyclones (Hupfer et al. 2003). All over the sea, both extreme high and low sea level events tend to occur in the meteorologically more variable winter months (e.g. Sztobryn et al. 2009; Suursaar 2011). Owing to the large meridional extent of the Baltic Sea, the required forcing conditions, as well as storm surge risks, may vary strongly in different parts of the basin. As a general rule, in the eastern section near the coasts of Lithuania, Latvia, Estonia, Russia and Finland, strong easterly winds tend to lower sea level, and westerly winds to raise it (Suursaar et al. 2002, 2006a). This applies for short-time variations, as well as for low-frequency variations through the corresponding changes in the Baltic Sea sea water volume. The lowest recorded sea level in the Gulf of Riga (−130 cm at Riga, −125 at Pärnu) occurred in December 1959 after a month with strong (20 m s−1) easterly winds during an anti-cyclonic blocking pattern (Suursaar et al. 2002). The highest surges usually occur in the eastern part of the Gulf of Finland (Fig. 9.12). Such events have been analysed by Klevannyy et al. (2001), Nekrasov et al. (2007), Averkiev and Klevannyy (2010). As most of the cyclones over Scandinavia and the Baltic Sea travel from south-west or west to the east, storm surges are usually generated in the eastern or north-eastern sections of the basin. The surges are particularly pronounced in bays away of the nodal (central) part of the sea, such as the Neva Bay of St Petersburg (up to 421 cm). At the same time, negative surges or sea level lowering occur along the opposite, Swedish, Danish or German coasts. Those high and low sea level areas evolve in time, as the cyclones travel through a particular area. For extreme surges to occur in the coastal waters of Estonia and St Petersburg (and for negative surges on the Swedish and Danish coasts), the centre of a powerful cyclone should bypass Estonia to the north over the Scandinavian Peninsula and Bothnian Sea to make the local wind direction veer from south-west to north-west (Suursaar et al. 2006b; Averkiev and Klevannyy 2010). As the strongest winds occur a few hundred kilometres to the right of the cyclone track, reduced friction on the sea surface and the elongated shape of the Baltic Sea together with the Pärnu Bay (in case of Pärnu tide gauge ) or Gulf of Finland (for Narva-Jõesuu and St Petersburg) provides a span for surge waves to increase towards the east. The diminishing water depth and narrowing gulf width reinforce this effect. Since 1703, there have been about 300 flooding events in St Petersburg due to a sea level rise above the critical value of 160 cm (Bogdanov et al. 2000). In 1970, a decision was taken to build a 25-km-long dam with huge closable gates to protect the city. This structure was finished in 2011. A map of historical water-level maxima around the Baltic Sea coast was recently compiled by Averkiev and Klevannyy (2010) (Fig. 9.12). The authors compiled information from various sources and reported the data according to the relevant national water-level reference system. Data from stations of short duration using tide gauges are also included. Thus, the map is not homogeneous and must be considered a rough picture of extreme water-level maxima in the Baltic Sea (see also Fig. 9.13 for comparison). More detailed information is available from the original references (e.g. Hupfer et al. 2003; Sztobryn et al. 2005 and references therein; Dailidienė et al. 2006; Suursaar et al. 2006a; Kowalewska-Kalkowska and Wisniewski 2009). Cyclone Gudrun on 9 January 2005, which attained a hurricane-like intensity according to the mean wind speed measurements (up to 34 m s−1) in Denmark, produced its highest sea level at most of the Estonian tide gauges (275 cm at Pärnu; the previous highest was 253 cm on 19 October 1967) and some Finnish tide gauges (Helsinki 151 cm, Hamina 197 cm, Hanko 132 cm, Turku 130 cm). However, previous records were not surpassed in the Gulf of Bothnia (Kemi 201 cm in 1982) or in St Petersburg, where sea level reached a relatively modest 230 cm. Gudrun’s eye passed 300 km north of Estonia, heading north-east and creating strong south-westerly winds (and later west–north-westerly winds once it had passed) reaching an average speed of 28 m s−1 over one hour. Another factor contributing to Gudrun’s storm surge was the relatively high background sea level (70 cm) in the Baltic Sea at the time (Suursaar et al. 2006b). The high background sea level was due to strong cyclonic activity during the preceding month, which had funnelled additional water through the Danish Straits into the Baltic Sea. Narrow bays in the Belt Sea and in the south-western Baltic Sea have experienced the second highest storm surges (see Fig. 9.13), but also the strongest negative surges. Sztobryn et al. (2009) described the characteristics of negative surges in the southern Baltic Sea using data (1955–2005) from three German gauge stations (Wismar, Warnemünde, Sassnitz) and two Polish gauges (Swinoujscie, Kolobrzeg). Their results confirmed that strong offshore winds (usually accompanied by low-pressure systems crossing the Baltic Sea) or storms driving the water away from the coast are the most important factor for the development of negative surges. The frequency and severity of negative surge events on the south-western Baltic Sea coast was found to decrease from west to east due to the baylike shape of the coast with an eastward opening (Sztobryn et al. 2009). The maxima in many tide gauge records of the area were established by one spectacular north-easterly storm in November 1872 (see Fig. 9.13). A negative surge of about 1 m occurred in the Gulf of Finland (Ekman 2009). Colding (1881) analysed the event in Denmark. The author concluded that a storm raises sea level at the coast proportional to the square of the wind velocity and that the effect is also proportional to the fetch and inversely proportional to the sea depth. Other major storm surge prone areas include the Gulf of Riga , and particularly Pärnu Bay (up to 275 cm) and the northern part of the Bothnian Bay (Kemi, 201 cm). Located close to the nodal line of the sea, the line of no vertical displacement in standing, basinwide oscillations—the Lithuanian and Latvian coasts in the Baltic Proper , the islands of Gotland, Åland and the Swedish coasts located leeward—will not experience high sea level events even during extreme storms. 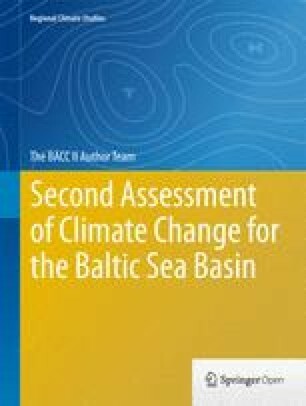 For a discussion of impacts on the coastlines of the Baltic Sea due to extreme sea level events, see Chap. 20. Richter et al. (2011) analysed long time series of extreme sea levels inferred from tide gauge records and historical documents of flood marks at the south-western Baltic Sea coast (Fig. 9.13). Changes in the magnitude of climate-driven extremes over the past 200 years could not be detected. This result contrasts with the findings of Sztobryn et al. (2005), who analysed extreme sea levels at the southern Baltic Sea coast (western and central parts) between 1950 and 2000 and found an increase in storm surges in the decades to 1990. Woodworth and Blackman (2004) analysed the Stockholm time series (Fig. 9.14) and showed that the spread of higher percentiles is greater than that of the lower percentiles. They explained this result primarily by asymmetries in air pressure data and the wind fields. Also, the higher percentiles have similar time dependence on MSL which means that sea level extremes have a greater response to changes in the winter NAO index than MSL. To summarise, Donner et al. (2012), Barbosa 2008 (see Sect. 9.3.2.1 and Fig. 9.8) found that trends in median sea level do not always coincide with the trends in extreme high and low quantiles. Upper quantiles tend to display a more positive trend than the median and the lower quantiles. This is consistent with the findings of Johansson et al. (2001), who investigated temporal changes in extreme sea level in Finland. They used homogenised Finnish series (13 stations, mostly covering the period 1923–1999) and found a significant 2–4 mm year−1 rise in annual sea level maxima. At the same time, the rise in annual sea level minima was only around 1 mm year−1. Along the Lithuanian coast, the average rise in maxima was around 2–3 mm year−1 (Dailidienė et al. 2006). Studies at the Estonian coastline showed a remarkable rise in annual sea level maxima of 3.5–11 mm year−1 after correcting for local uplift rates (Vallner et al. 1988; Suursaar and Sooäär 2007). Even excluding the prominent event of 2005, the rise in annual sea level maxima was significantly higher than the rise in MSL (1–2.6 mm year−1) and the rise in annual sea level minima (0.8–3.1 mm year−1). The hydrodynamic mechanism responsible for these differences appears linked to the location of Estonian and Finnish tide gauges with respect to the predominant strong winds (Suursaar et al. 2006a, Suursaar and Kullas 2006). Analysis of local wind data from Estonian coastal stations has shown that, although the mean wind speed is likely to have decreased over the past 50 years, the westerly wind component and the extreme wind events have increased (e.g. Suursaar and Kullas 2009a, b; Jaagus 2009, Jaagus and Kull 2011, see also Chap. 4, Sect. 4.3). This is in good agreement with findings on changes in cyclone trajectories above the Baltic Sea (Sepp et al. 2005; Jaagus et al. 2008). The magnitude of an expected extreme event at a given location is usually described by the magnitude of the expected maximum extreme event over a certain period, such as 100 years or 1000 years. Alternatively, an observed extreme event may be described as the one expected to occur once in a certain period. Normally, a storm surge prone area (city, port) has established critical sea level values, usually based on statistical analyses of long tide gauge records. However, these projections are only truly valid in an unchanging climate. To incorporate the effects of future climate change requires additional information, climate simulations from numerical models and/or extrapolation of recently observed trends. However, as extreme events are by definition rare, empirical extrapolation carries large uncertainties. There are many examples worldwide of ‘storms of the century’ or ‘one in a thousand years’ surge events that occur more frequently than expected from statistical analysis. This may be due to the limited number of observations available for estimating the magnitude of extreme events. For example, a comparison of empirical return periods against the corresponding theoretical distributions shows a reasonable fit for three Estonian tide gauges, but no fit in the case of Pärnu maxima (Suursaar and Sooäär 2007). The same situation exists for the Travemünde tide gauge in Germany, where sea level in 1872 was extraordinarily high and appeared to be an outlier in relation to the observed distribution of extreme events. However, when the tide gauge data were supplemented by historic storm surge water levels and simulations from numerical models, the 1872 value fitted well with the distribution based on this larger dataset (see Mudersbach and Jensen 2009). This is in general agreement with the findings of the MUSTOK project (model-based investigation of extreme water levels at the German Baltic Sea coast, see Jensen et al. 2009 and references therein). One of the assumptions in extreme value analysis is that there is no physical limit that an extreme event can attain, which is not a totally valid assumption in the case of storm surges. MUSTOK aimed at combining model-based estimates of the maximum attainable storm surge, high-quality data from instrumental measurements, and the more uncertain information from historical sources, to provide better estimates of storm surge return periods at several sites in the Baltic Sea. Including physically based limits for the possible extremes can substantially modify the probability of storm surge occurrence. For instance, using recent instrumental data only would have suggested that the storm surge in Travemünde was a once-in-10,000 year event, whereas including all three datasets in the projection would shorten the return period to 3400 years. The properties of wind waves depend primarily on wind speed and duration, and effective fetch length. In semi-enclosed shallow basins, wave properties are also modified through wave–seabed interaction (via refraction, shoaling, breaking or reflection) and diffraction behind obstacles. The Baltic Sea is a challenging location for wave scientists; the area has a very complex geometry and the associated high variability in wind fields gives rise to extensive spatio-temporal variability in the wave fields. Wave simulations therefore require a high spatial resolution and a careful choice for the location of wave measurements. The presence of sea ice (see Chap. 8) may substantially affect wave patterns and complicates wave measurements in winter. As floating devices are normally removed before the ice season (Kahma et al. 2003; Tuomi et al. 2011), measured wave data (especially in the northern Baltic Sea) display extensive time gaps and estimates of commonly used variables (e.g. annual mean wave height or period) become biased for seasonally ice-covered seas (Tuomi et al. 2011). Relatively shallow areas and convergent wind patterns may lead to unexpectedly high waves, formed through occasional wave energy concentration in some areas (Soomere 2003, 2005; Soomere et al. 2008a). Also, specific wave generation conditions for offshore winds over irregular coastlines (Kahma 1981; Kahma and Calkoen 1992) or under so-called slanting fetch (when wind blows obliquely across the coastline) frequently occur in some sub-basins (Pettersson et al. 2010). Long-term (>10 years) instrumentally measured wave data are available only at three sites (Fig. 9.15). In terms of climate change, only data from upward-looking echo sounders at Almagrundet (1977–2003, Broman et al. 2006) and from a directional wave-rider at Darss Sill have been analysed (Soomere and Kurkina 2011; Soomere et al. 2012). The data from the wave-rider in the northern Baltic Proper were discussed by Kahma et al. (2003), Tuomi et al. (2011). Numerous relatively short-term wave measurement sites around Finland in the 1980s and 1990s were briefly described by Soomere (2008). Satellite altimeter data for wave properties have been used in a very small number of studies (Cieślikiewicz and Paplińska-Swerpel 2008; Tuomi et al. 2011). Historic wave observations from ships in offshore regions combined with the results of hindcast simulations have been used to generate wave atlases for the Baltic Sea (Rzheplinsky 1965; Russian Shipping Registry 1974; DWD 2006; Lopatukhin et al. 2006) and its sub-basins (Rzheplinsky and Brekhovskikh 1967; Druet et al. 1972; Schmager 1979; Sparre 1982). Visual observations from anchored lightships and permanent coastal stations (Fig. 9.15, Table 9.2) cover a much longer time interval than instrumental measurements. Visually observed wave heights generally agree well with significant wave heights , whereas the visually estimated wave period is, on average, a few tenths of a second shorter than the peak period from hindcast simulations (Gulev and Hasse 1998, 1999). In contrast to offshore ship-based wave observations for estimates of wave climate (Gulev and Hasse 1999; Gulev et al. 2003), use of observations from coastal sites is more problematic. On the one hand, such data pose intrinsic quality and interpretation problems, have a poor temporal resolution , contain a large element of subjectivity and a substantial amount of noise (Zaitseva-Pärnaste et al. 2009), and only partially characterise the open sea wave fields (Soomere 2005). On the other hand, they have exceptional temporal coverage: regular observations have been carried out using a unified procedure at several locations for almost seven decades (Zaitseva-Pärnaste et al. 2011; Pindsoo et al. 2012). Visual wave observations from Danish lightships have been made at multiple locations including Gedser Rev and Halsskov Rev and a permanent station at Drogden with six to eight observations per day (Sparre 1982; Fig. 9.15). The data are digitised from 1931 until the withdrawal of the ships in the 1970s and 1980s. Observations from Drogden continued until 1994. The ships were located at shallow sites of particular danger to ship traffic. This may affect the wave field statistics. Also, the lightships were relocated short distances on several occasions and there are some temporal gaps. Nevertheless, the dataset constitutes a unique source of information on the western Baltic Sea historic wave climate. Wave observations on the eastern coast of the Baltic Sea have been made in many locations since the mid-1940s or 1950s (Table 9.2) usually three times per day using perspectometers (binoculars with specific scaling) and/or buoys or bottom-fixed structures to better characterise wave properties. The observers scanned areas at least 4 m deep about 200–400 m from the waterline. The observation conditions vary considerably between locations; for example at Pakri (Estonia), the observer was located on top of a 20-m-high cliff and the water depth of the area observed was 8–11 m. All sites of visual observations presented in Fig. 9.15 only partially represent the open sea wave conditions. Although the potential distortions due to the sheltering effect of the shoreline and the relatively shallow water depth may affect the results of individual observations, it is likely that long-term variations and trends in offshore wave properties would be evident through the analysis of large pools of visual observations. Owing to short daylight duration, only one to two observations per day are possible in northern areas in autumn and winter. To avoid the bias caused by a varying number of observations per day, the analysis of wave data is mostly based on the set of daily mean wave heights (Soomere and Zaitseva 2007; Zaitseva-Pärnaste et al. 2009, 2011). The spatial resolution of numerically reconstructed global wave datasets such as the KNMI/ERA-40 Wave Atlas (1.5° × 1.5°) (Sterl and Caires 2005) is insufficient for the Baltic Sea. Several attempts to numerically reconstruct the wave climate in the Baltic Sea using a better resolution (down to about 3 nautical miles or about 5 km) have been undertaken for many areas and single locations (Table 9.2). Schmager et al. (2008), Soomere (2008) reviewed the relevant literature until 2007 and described the basic features of the wave climate. Long-term reconstructions of the Baltic Sea wave fields are a complicated task and usually contain high uncertainties (Cieślikiewicz and Paplińska-Swerpel 2008; Kriezi and Broman 2008). The largest source of uncertainty is the wind information. The quality and spatial resolution of the wind data (down to about 10 km, Tuomi et al. 2011) have increased over the past decade. Simulations of long-term change in wave fields are, however, hampered by substantial temporal inhomogeneity (Tuomi et al. 2011), large spatial differences in data quality (Räämet et al. 2009; Soomere and Räämet 2011), and by the inability of even the most advanced atmospheric models to reproduce air flow accurately in several Baltic Sea sub-basins (Keevallik and Soomere 2010). Nevertheless, long-term numerical reconstructions of change in the Baltic Sea wave climate are available for 1958–2002 based on output from the National Centers for Environmental Prediction/National Center for Atmospheric Research (NCAR/NCEP) wind reconstructions (Augustin 2005; Schmager et al. 2008; Weisse and von Storch 2010) and for 1970–2007 based on adjusted geostrophic winds (Räämet and Soomere 2010; Soomere and Räämet 2011). The relatively small size of the Baltic Sea, frequent large-scale homogeneity in the wind fields and the short saturation time and memory of wave fields make it possible to use simplified wave hindcast schemes (Soomere 2005), high-quality wind data from a few points (Blomgren et al. 2001) and/or properly calibrated simple fetch-based wave models (Suursaar and Kullas 2009a, b; Suursaar 2010) to reproduce local wave statistics with an acceptable accuracy . The use of such models for identifying spatial change in wave statistics is limited, however, as they can basically only reproduce change in the local wind field. Existing sources of Baltic Sea wave information make it possible to identify basic long-term wave properties (average and extreme height, occurrence distribution and height–period combinations) and their spatial variations. The Baltic Sea wave climate is, on average, very mild. The typical long-term significant wave heights are about 1 m offshore in the Baltic Proper (Kahma et al. 2003; Broman et al. 2006; Schmager et al. 2008; Tuomi et al. 2011), 0.6–0.8 m in the open parts of larger sub-basins such as the Gulf of Finland (Soomere et al. 2010) or Arkona Basin (Soomere et al. 2012) according to measurements and numerical simulations, and well below 0.5 m in semi-sheltered bays such as Tallinn Bay (Soomere 2005; Kelpšaitė et al. 2009) according to simulations (Fig. 9.16). These values are 10–20 % lower in the nearshore regions (Suursaar and Kullas 2009a, b; Suursaar 2010). The most frequent wave heights are also about 20 % lower than the long-term average wave height (Kahma et al. 2003; Soomere 2008; Soomere et al. 2012). The spatial pattern of hindcast average wave heights (Fig. 9.16, left panel) contains either an elongated maximum (Augustin 2005; Tuomi et al. 2011) or several local maxima in the eastern Baltic Proper (Jönsson et al. 2003). A hindcast using geostrophic winds indicates another maximum to the south of Gotland (Räämet and Soomere 2010). This may be explained by large interannual and decadal variability in wind patterns over the area that naturally causes extensive variations in both average and extreme wave patterns. A very similar spatial pattern of heights to the one shown in Fig. 9.16 (left panel) is found for extreme waves (threshold of the 1 % or the 99th percentile of significant wave height for each year) based on geostrophic winds (Soomere and Räämet 2011). The empirical distributions of the occurrence of different wave heights at offshore measurement sites (such as Almagrundet, Bogskär, the wave-rider in the northern Baltic Proper and at the Darss Sill) resemble a Rayleigh distribution, with typical values of the shape parameter of 1.5–1.8 (Soomere 2008; Soomere et al. 2011). The most frequent wave heights are usually in the range 0.5–0.75 m. Significant wave heights greater than 4 m occur offshore with a probability of about 1 %, that is, during about 60 h per year. Significant wave heights over 7 m have been measured, on average, about twice per decade in the northern Baltic Proper (Soomere 2008; Tuomi et al. 2011) and so can be considered extreme conditions. The wave climate is, however, highly intermittent and the sea occasionally experiences very high waves. The largest instrumentally measured values of significant wave heights (H s) are H s = 8.2 m in the northern Baltic Proper on 22 December 2004 (Directional Waverider, Tuomi et al. 2011) and H s = 7.82 m on 13/14 January 1984 at Almagrundet [upward-looking echo sounder; estimated from the 10th highest waves based on Rayleigh distribution; an alternative estimate from the wave spectrum is H s = 7.28 m (Broman et al. 2006)]. The highest individual instrumentally measured waves were 14 and 12.75 m, respectively. Numerical simulations indicate that H s may reach 9.5–10 m in the north-eastern Baltic Proper at the entrance to the Gulf of Finland , to the north-west of the Latvian coast and in the south-eastern part of the Gulf of Gdansk (Schmager et al. 2008; Soomere et al. 2008a; Tuomi et al. 2011). The properties of waves in a particular region and storm event depend on the match of the geometry of the sea area and the wind pattern of the storm (Augustin 2005; Soomere et al. 2008a; Schmager et al. 2008). Typical and extreme wave heights are much lower in sub-basins of the Baltic Sea. A large proportion of the low waves (H s < 0.25 m) for most of the coastal visual observation sites (except for Vilsandi) (Zaitseva-Pärnaste et al. 2009, 2011) resembles an analogous property of simulated distribution in semi-sheltered bays (Soomere 2005). The frequency of occurrence of waves with H s > 4 m is very low for all sub-basins except the Bothnian Sea (Tuomi et al. 2011) and waves with H s > 2 m may be considered extreme for semi-sheltered areas such as the Darss Sill (Soomere and Kurkina 2011; Soomere et al. 2012). However, even sheltered bays may experience very strong waves during violent storms from unfavourable directions; for instance, H s > 4 m apparently occurred in the interior of Tallinn Bay on 15 November 2001 (Soomere 2005). The maximum measured significant and single wave height in the Gulf of Finland was 5.2 and 9 m, respectively, on 15 November 2001 (Tuomi et al. 2011). Other sub-basins are not covered by regular wave measurements. The largest instrumentally measured wave height in the southern Sea of Bothnia (6.5 m) was recorded on 26 December 2011 (Pettersson et al. 2012). The maximum H s recorded at the Darss Sill is 4.47 m (Soomere et al. 2012). Numerically simulated maxima of H s are 7.6 m in the Sea of Bothnia, about 5 m in the Gulf of Finland and Gulf of Riga , and 6.7 m in the Arkona Basin (6.23 m according to another simulation ). The most frequent periods are 3–5 s offshore and 2–4 s in coastal areas (Soomere 2008). Most of the combinations of wave heights and periods roughly correspond to wave fields with a Pierson-Moskowitz (PM) spectrum (Soomere 2008; Räämet et al. 2010; Soomere et al. 2012). This indicates a large proportion of fully saturated seas in this region at wind speeds up to about 8 m s−1 (Schmager et al. 2008). The properties of the roughest seas, however, match better a JONSWAP spectrum (corresponding to fetch-limited seas and characterised by shorter periods than wave fields with a PM spectrum), especially in areas with limited fetch such as the Darss Sill (Soomere et al. 2012). Swells are very limited in all parts of the Baltic Sea. Several observation sites reveal short-term (weekly) features in the wave activity that reappear regularly, for example, a relatively calm period at the end of December and beginning of January in the northern Baltic Sea (Soomere et al. 2011). These features are probably site-specific and only persist for a few decades (Soomere et al. 2012). The extensive seasonal variation in wind speed (Mietus 1998) causes substantial variability (by a factor of two in coastal areas and up to three in offshore regions) in wave height at monthly scales (Schmager et al. 2008; Soomere and Räämet 2011) (Fig. 9.17). The calmest months are April to July and the windiest October to January (see also Chap. 4). The most extensive interannual and decadal variations in wave properties exist in the visually observed wave data (Fig. 9.18). The appearance and spatial coherence of such variations has undergone major change. Short-term (interannual and up to 3 years) variability in annual mean wave height displays a consistent pattern (with a typical spatial scale of more than 500 km) from the southern Baltic Proper to the eastern Gulf of Finland from the mid-1950s to the mid-1980s. The coherence is lost in the mid-1980s (Soomere et al. 2011): since then, years with relatively large wave heights at the coasts of the Baltic Proper correspond to calm years in the eastern Gulf of Finland and vice versa. Studies of variations at longer timescales reflect greater spatial variability of wave properties at different sites. Augustin (2005) identified an increase of 0.3 m in the simulated annual 99th percentile of H s in the Baltic Proper (58° N, 20° E) that was mostly due to an increase in the frequency of severe wave events (Sect. 2.3.5 in BACC Author Team 2008). Simulations over the period 1970–2007 (Soomere and Räämet 2011) confirmed the presence of an increasing trend at this location but also indicated a complex spatio-temporal pattern of change (with scales down to about 100 km) in the Baltic Sea wave fields (Fig. 9.16). Moreover, the change in wave height over time in the northern Baltic Sea does not follow the gradual increase in annual mean wind speed in the northern Baltic Proper (Island of Utö, Soomere and Räämet 2011). Analogous changes of even greater magnitude were identified from visual observations for the eastern Baltic Sea coast and from instrumental measurements at Almagrundet (Fig. 9.18). There is an overall decrease in wave height from about 1960 until the end of the 1970s (Soomere et al. 2011). Wave height increases substantially in the northern Baltic Proper from the mid-1980s until the mid-1990s (Broman et al. 2006; Soomere and Zaitseva 2007), similar to what happens in the south-western Baltic Sea and North Atlantic Ocean (Gulev and Hasse 1999; Weisse and Günther 2007). The increase was followed by a considerable decrease since 1997 (Broman et al. 2006; Soomere and Zaitseva 2007). Wave height at the south-eastern Baltic Sea (Lithuanian) coast showed the opposite: a rapid decrease until about 1996 followed by a rapid increase (Zaitseva-Pärnaste et al. 2011). The variations were weaker in the simulations of Soomere and Räämet (2011) and in reconstructions using a fetch-based model and local wind data (Suursaar and Kullas 2009a, b; Suursaar 2010). Such extensive variations raise the issue of the significance of factors such as instrument error, observers’ error or noise in the data. The quality of data showing a decrease in wave intensity at Almagrundet for 1997–2003 was questioned by Broman et al. (2006), but the similarity of the changes at Almagrundet and Vilsandi still suggests that both datasets probably reflect real change (even if magnitude is possibly overestimated). The timing of the variations matches an almost twofold increase in the number of atmospheric low-pressure observations at Härnosand in the 1990s (Bärring and von Storch 2004) and so may simply reflect a change in the trajectories of cyclones. For some locations along the Estonian coast, simplified fetch-based models using one-point coastal wind have demonstrated that wave intensity changes quasi-periodically and reveals no statistically significant trend (Suursaar and Kullas 2009a, b; Suursaar 2010). Quite large variations in the average wave periods (from about 2.3 s in the mid-1970s to 2.65 s around 1990) were found for selected sites (Suursaar and Kullas 2009b). This is apparently a local effect, because in most of the Baltic Sea the most frequent wave periods and the distribution of the different wave periods are effectively unchanged (Soomere et al. 2012). Substantial changes (up to 90° from NW to SW) in the most frequently observed wave directions occurred at Narva-Jõesuu during the latter half of the twentieth century (Räämet et al. 2010) probably as a reflection of substantial change in local wind direction (Jaagus 2009; Jaagus and Kull 2011). Similar changes (of much smaller amplitude) were observed at the Lithuanian coast and were interpreted as a possible reason for change in the distribution of erosion and accumulation areas (Kelpšaitė et al. 2011). In general, it is likely that change in the simulated directions of wave propagation may result in substantial changes in the patterns of wave-driven sediment transport (Viška and Soomere 2012). The changes discussed here are not necessarily evident in all sub-basins of the Baltic Sea. For instance, there has been effectively no change in the annual mean H s at the Darss Sill (Soomere et al. 2012). The overall course in the wave activity in several other parts of the Baltic Sea also reveals no clear long-term trend (Soomere and Zaitseva 2007; Soomere 2008; Soomere et al. 2012). Only at Narva-Jõesuu in the Gulf of Finland is the wave intensity gradually decreasing (Soomere et al. 2011). As previously mentioned, numerical simulations have revealed a complicated pattern of trends in wave intensity (Fig. 9.16, right panel). The spatial pattern of changes in the extreme (99th percentile) wave heights largely follows the pattern of changes in average wave height (Soomere and Räämet 2011). The decrease in wave intensity has been greatest between Öland and Gotland, and to the south of these islands to the Polish coast. In agreement with Augustin (2005) and the BACC Author Team (2008), a considerable increase in wave activity was indicated by the model in most of the northern Baltic Proper . The local maximum in the Arkona Basin and a rapid increase in simulated wave height in this region may stem from the overestimation of geostrophic wind speed in this part of the basin (see Pryor and Barthelmie 2003). There is a very slow decrease (about 0.01 m s−1 year−1) in the annual mean wind speed at Kalbådagrund, Gulf of Finland (Soomere et al. 2010) where numerical simulations indicate very minor change in wave intensity (Suursaar and Kullas 2009b; Suursaar 2010; Soomere et al. 2010). In some areas, change in average wave height and extreme wave height have opposite signs (Augustin 2005; Soomere and Healy 2008). For example, no long-term trend in average wave height exists at this site but the 99th percentile considerably decreased over 1991–2010. Hindcast simulations suggest a sawtooth-like behaviour for the 99th percentile, with a gradual increase for 1958–1990 from about 4 to about 5 m, a sudden decrease in 1991–1992 and a subsequent increase (Soomere and Kurkina 2011). Suursaar and Kullas (2009b) noted a negative trend in the 99th percentile near the north Estonian coast and a weak, opposite, gradually positive trend in average wave height. Simulations using the WAM wave model (Komen et al. 1994) showed that, unlike for average wave height, there has been a substantial decrease (of about 10 %) in maximum wave height near the southern coast of the Gulf of Finland and an almost equal increase to the north of the axis of the Gulf of Finland (Soomere and Räämet 2011). This feature may potentially cause enhanced coastal erosion in the affected areas in the north-eastern Gulf of Finland (Ryabchuk et al. 2011). It is apparently related to the major change in wind direction over the Estonian mainland: the frequency of south-westerly winds has increased considerably over the past 40 years (Jaagus 2009; Jaagus and Kull 2011). The GIA—a readjustment of the Earth’s crust to the offloading of the ice sheets in the northern hemisphere that formed during the last glaciation—exerts a strong influence on sea level relative to land. Land uplift is stronger in the northern Baltic Sea, attaining rates close to 10 mm year−1, whereas in the southern Baltic Sea, it is close to equilibrium with some areas sinking by about 1 mm year−1. Analysis of individual records of land-locked tide gauge measurements corrected for the vertical land movements indicate that Baltic Sea sea level may have risen during the twentieth century at rates of around 1.5 mm year−1, which are close to the rate of global sea level rise. However, uncertainty is large because the margin of error of the estimates of land uplift—based on GPS data—may be locally of the order of 1 mm year−1, and the time overlap between tide gauges and GPS measurements is short. An accurate estimate of absolute, climate-induced, Baltic Sea sea level rise over the twentieth century, is still not available, but is unlikely to deviate much from the global average. In more recent decades, as satellite altimetry data have become available, the basinwide rate of sea level rise may be around 5 mm year−1 (with an uncertainty of roughly ±3 mm year−1) with the central estimate thus higher than the recent global mean of 3.2 mm year−1. Sea level records display long-term developments that are still not fully explained. These include (1) the long-term widening of the annual cycle of sea level (winter maxima minus spring minima), (2) the more positive long-term trends of upper-range sea level measurements as opposed to lower-range sea levels—thus implying a long-term widening in the range of sea level observations, and (3) the time-varying correlation between sea level records and the main patterns of atmospheric climate variability, such as the NAO. Extreme sea level is caused by storm surges driven by the passage of atmospheric cyclones. There is some evidence that the intensity of storm surges may have increased in recent decades in some parts of the Baltic Sea, and this has been attributed to long-term shifts in the tracks of some types of cyclone rather than to long-term change in the intensity of storminess. Analyses of storm surges have focused on local records, however, and there is no systematic basinwide analysis of change in storm surges yet available (see Chap. 4). Since the first Baltic Sea Assessment (BACC Author Team 2008), new long-term series of instrumental wave data (longer than 20 years) and visually observed wave data (longer than 60 years) as well as several new high-resolution (~3 miles) long-term wave hindcast simulations have become available. New estimates of the basic properties of the wave climate in the Baltic Sea as a whole and its sub-basins have been derived, such as distributions of various wave properties (periods, height), spatial patterns of long-term change and decadal variations on timescales of 20–30 years. Analyses show no significant change in average wave activity in the Baltic Sea basin. However, extensive spatial patterns of changes within the basin exist, possibly leading to long-term variations in areas with the greatest wave intensity. Regional studies have even revealed different trends in average and extreme wave conditions that are probably due to systematic change in wind direction.